Merry Christmas everyone! Looking like ice, snow and overnight temps in the teens for my swim - better get the heater fired up:). Me! But my daughter says that I am mathematically challenged so I may need help! Is the CanAm being held this year? Anyone know if the CanAm is happening this year? First Fishing Follies Past, Present, and Future by Rob Schoborg Boone Lake, Piney Flats, TN The holidays bring on a nostalgic frame of mind, which seems to get more intense as you age. When I was young, the summers stretched out endlessly and possibilities seemed limitless. As I get older, the realization that I am approaching roads end can no longer be easily ignored. I have come, even more, to treasure my family, friends, and experiences. So, I thought I would steal an idea from Charles Dickens and review some highlights of FFF’s past, present, and (hopefully) future. But before we get to that, I would like to ruminate on why I so appreciate this event. Well, first of all, I love to fish – particularly for carp. I have also been an athlete most of my life, but cumulative injuries have forced me to stop competing. The FFF gives me a much-needed competitive outlet. Most of all though, the FFF has provided me with a way to celebrate my father’s life (he loved to fish) and to share something I love with my family. So, a big "thank you" to Jerome, Frank, and the CAG board for continuing an event that has brought a lot of joy to my family. Even should CAG decide, some day, to discontinue the FFF, I will still fish on New Year’s Eve for as long as I am able. FFFs Past... I can still remember seeing the description of the FFF 2007 on the CAG website and thinking “what a cool idea”. Though life events ranging from ice storms, car trouble, and work commitments have prevented us from participating every year, these are some of my favorite memories from FFFs past. In 2007 (our first year), I most remember my step-son Chris getting a strong hit at 12:03AM. He wasn’t paying attention and did not set the bait-runner, so his rod skittered across the dock and almost ended up in the drink. He missed the fish too! Despite the mishap, Chris won the junior division with 33lb 7oz total and received a telescoping carp rod as a prize. The “green rod” remains a prized possession and I remain amazed that he trusts me enough to let me use it when he is not fishing! The 2009 FFF was a big year for our family, as Chris caught what is still (I think) the largest fish reported during this event – a 54 lb/41 inch blue catfish. After an epic 30+ minute fight, he landed it using the carp rod he won in 2007! I can still picture the look of utter disbelief on his face when the fish broke the surface for the first time - it looked like a blue-gray WV Beetle with fins. After we released it, Chris named it “Whiskers”. My step-daughter Sarah banked 7 commons totaling 77lb 1oz and managed to win the FFF monster phone, junior monster phone, and emperor awards. She still has the trophies and even listed her FFF participation on her UCSD application – and they let her in anyway! Though we do try hard, the FFF is not just about winning awards. 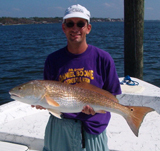 My most cherished memory from 2009 was not of the big blue cat or Sarah’s awards – it was the fact that Chris volunteered to quit fishing so that his baby sister could have a better chance of landing enough fish to win the Junior division. Chris has subsequently grown into a compassionate and caring young man, of whom I am immensely proud. In 2010, our FFF plans were nearly derailed by a burst pipe in our basement and a malfunctioning car battery. By the time we arrived at our fishing spot on Lake Loudon, it was New Year’s day. The highlight was my step-daughter Sarah’s capture of a 17lb 15oz common carp, which is her pb fish of any type to date! In 2013, Sarah, Chris and I hosted my sister Kim, as well as her children Julie, Josh, Jessica and, finally, Kurt (Jessica’s boyfriend). – all of whom are from Tulsa, Oklahoma. We started fishing at midnight on Boone Lake, but blanked. We woke up the following morning and journeyed to Loudon Lake, in Knoxville. In intermittent cold, driving rain, everyone (except me) managed to bank a fish. Kim pulled in the largest of the day – a 17 lb common. The most humorous event was Kurt vaulting a 4 foot metal railing at a run to get to “his” fish – at considerable risk to his man parts! For me, spending the holidays with my wife, my kids, my mom and Kim’s family was the best part – the FFF was just the icing on the cake! After fishing, we had some well-deserved barbecue! In the 2014 FFF, we fished for about 10 hours on New Year’s Day on Watauga Lake in east Tennessee. Sarah banked our single fish, a 12 lb common - thus ensuring that we did not get blanked!. It was a cold, blue sky day and the sunset was particularly spectacular. More importantly though, this was Sarah’s last year in the FFF as a junior. Her high school graduation was but a year away. After that…college….a job in a far away place...a family – who knows? All I knew was that she was not my little girl any more, which is still somehow happy and sad at the same time. FFFs Present... Our 2016 FFF began about 3 months ago. First, I had to decide upon a location. Most of our previous FFF swims were an hour (or more) away from our house. I decided I wanted to stay near home this year. Unfortunately, Boone Lake, which we live on, is down by nearly 30 feet due to dam repairs, and so finding fishable water on public land is a challenge. In November, I baited up and test fished several spots, finding success on a section of bank near Pickens Bridge. So - I had my spot! Second, we had to decide who would join me in the 2016 FFF. The kids were going to be out of town from Christmas Eve to Jan. 2 on vacation with their dad - so they could not participate. Michelle had a party invite on Jan. 1 and also opted out. So it initially looked as if I would be fishing the 2016 FFF alone. However, about 3 weeks ago, my sister called me to let me know she was planning to visit between Dec. 27 and Jan. 2. So I had my fishing partner…! Third, I had to prepare the venue. In the 9 days before the FFF, I put out one 50 lb bag of cracked corn per day at 3 day intervals - the last on Dec. 31. We pre-fished on Dec. 27 and banked about 15 fish over the course of the day. Michelle even got in on the action! I also landed a small carp that was blind in one eye and had a large open skin lesion on its flank. I would see this fish again on Jan. 1.Finally, it was Dec. 31! I got all the gear together and started packing the car at about 4PM. After that I made up a fresh batch of corn, grits, and oats method mix. Next came the taste test…ummmm good! We arrived at our fishing spot at about 11:30PM. It was cloudy, calm, and around 40 degrees. My first priority was getting baited up and getting lines out. After that, I set up the mat, net, chairs and lantern. Then we sat down to wait. At midnight, we were regaled by some local folks with fireworks and an enthusiastic exercise of second amendment rights. Automatic weapons fire went on for about 5 minutes in 3-5 round bursts. Every 30 or so rounds there was a short break for magazine changes. That must have been $500 worth of 5.56mm ammo and I can only imagine the brass pile! At about 12:19AM, an alarm started squealing and our first fish (7 lb) was in the net at 12:21AM. Kim's first fish (4 lb 13 oz) came at 12:52AM. Look at that smile! We caught pretty consistently for the next 3 hours - with fish at 1:12AM, 1:26AM, 1:44AM, 1:59AM, 2:16AM, 2:39AM, 2:45AM, 2:57AM; 3:08AM; 3:27AM; and 3:53AM. Kim caught our smallest fish (2 lb 3 oz) at 1:26AM. At 4:26AM, I landed a 10 pounder - my largest of the day. Kim had gone on a coffee run and so I had to use the camera on self-timer. Unfortunately, a tripod malfunction resulted in a "no count" for FFF scoring. A valuable lesson - check the picture before releasing the fish! Kim with a 4lb 8oz common at 6:53AM. The next fish was mine - a 3lb 14oz common banked at sunrise at 7:32 AM. The fishing picked up throughout the morning - with fish coming in at 8:05AM and 8:10AM (a double), 8:27AM, 8:35AM, 9:02AM, 9:30AM and 9:34AM (another double), 10:05AM, 10:16AM, 10:58AM, 11:14AM, and 11:48AM. We had a noon lull and then fishing picked up again - with 9 more fish between 1 and 5PM. Kim banked our largest fish of the day at 4:06PM - a 13 lb 13 oz common. Well done Kim! At 4:27 and 4:54 PM, we landed 2 more commons. Kim caught her last fish of the day (a 5 lb common) at 5:22PM - after which the bitter wind convinced her call it a day - but what a day - 17 + hours straight of carp fishing! I decided to try to make it to the FFF 24 hour mark. Just after sundown, the wind dropped and the temperature got a bit warmer. I banked 4 more carp between 5:50PM and 6:30PM - including my old friend from our pre-fishing session a few days before! I fished for about 2 more hours without a run. The night was clear and cold and I passed the time watching Orion's belt come over the horizon and listening to raccoons fight and screech owls cry. Finally, the increasing cold convinced me to head home after a very eventful 2016 FFF! As I was pulling out, a game warden showed up and checked my license. He asked what I was doing and I told him about the FFF. His reply was…carp! really? Perhaps I made another convert... Overall, Kim and I caught a total of 42 fish weighing 268 lbs. In terms of fish caught, our most successful FFF ever! Since I am a scientist by trade, I decide to graph out our catches in number of fish per hourly interval versus time - just to see how well distributed the catches were over the 21 hours of fishing. I added the predicted times of greatest fish activity from the Solunar Tables for Jan. 1 (green boxes). As you can see, our catches came in 3 waves that I suspect corresponded to the movement of small schools of fish along the shoreline. Unsurprisingly, our periods of greatest success did not correspond to the Solunar Table predictions. In our swim, there were also specific areas where the fish were concentrated - despite the fact that the swim was evenly pre-baited from a canoe. I could not find any obvious terrain features on a topo map but hope to get out with a depth finder soon to see what structure is out there. FFFs Future... I would really like to fish the entire 24 hours next year – and possibly convince my lovely wife and kids to join me for at least part of the day. I have also identified a few other promising spots on Boone Lake that I plan to test fish, in the hope of banking some larger fish. I would also like to identify some more productive locations on Watauga Lake - which is tough to fish but amazingly beautiful. I suspect an FFF in Oklahoma is in my near future - I just hope my old carping spots on the Arkansas River still hold fish! In the more distant future, who knows – maybe I’ll have some grandkids who will be willing to join their crazy grandpa for some New Year’s fishing action! Only 361 days until the next one and I am countin' down the days... Cheers and have a great 2016!